It's hard to get a feel for what Ethienne actually sounds like until you take a real listen to it. At times during the band's latest release The Old And The New World, the band's rock edge takes to the front, layering customary guitar riffs with synth and eerie electronics as in "A Fist In The Snow", or keystrokes as in "Random Walk". Other times the band shows a poppier side, like in the dancy electro-pop "Ultrapop!" or the beautiful piano ballad "Crave", or an atmospheric, post rock like side like in "Once Again" or "Iter". 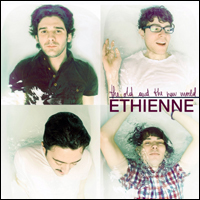 Really, the best way to describe Ethienne is Ethienne, as the band takes influences across genres and infuses them into their own music, creating somewhat of a boundary hopping record. Deep Elm has found another gem of a band, one whose uniqueness will continue to assist the growth of the label, and leading them to even more success. You can stream the record on the band's Deep Elm page here. These guys are crazy... is this their first album?! Because it's really really good. Thumbs up for ethienne! This album is sick guys. I would like to have the cd version, not the bloody mp3.